Weather here in the northeast interfered with the normal run of late winter activities. Some events were cancelled, some went on without us, and some were rescheduled. 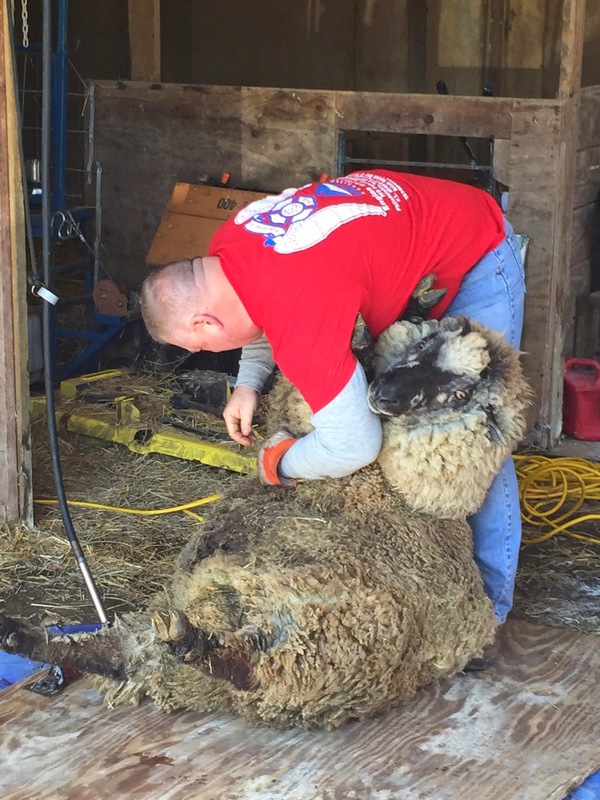 Shearing day was a reschedule. Usually the end of February or the beginning of March, the event at Winter's Past Farm's was delayed until the end of March. According to our shearer, most shepherds in this region have pushed the date by about a month this year. The fleece skirting table is our domain. There were three of us on this detail this year. 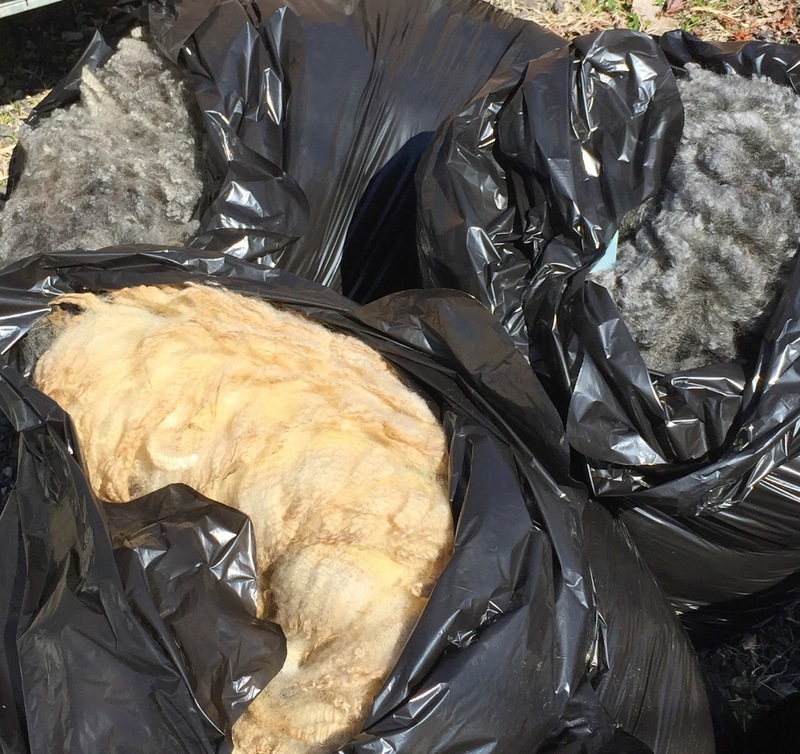 We clean up the newly-sheared fleece, bag it, and keep moving. Our goal is to get rid of most of the worst. K. keeps her sheep covered, which results in a significantly cleaner fleece, but the neck area always has hay bits from the feeder and the tail--well, no need to explain the stuff at that end. It all needs to go. This is just the first pass, but if we don't remove the bulk of of the hay and excrement, they will contaminate the entire fleece. It will be worthless. The market for small shepherds is spinners and other fiber artists. The circle is small. It's important to maintain credibility as a shepherd who produces clean fleece. 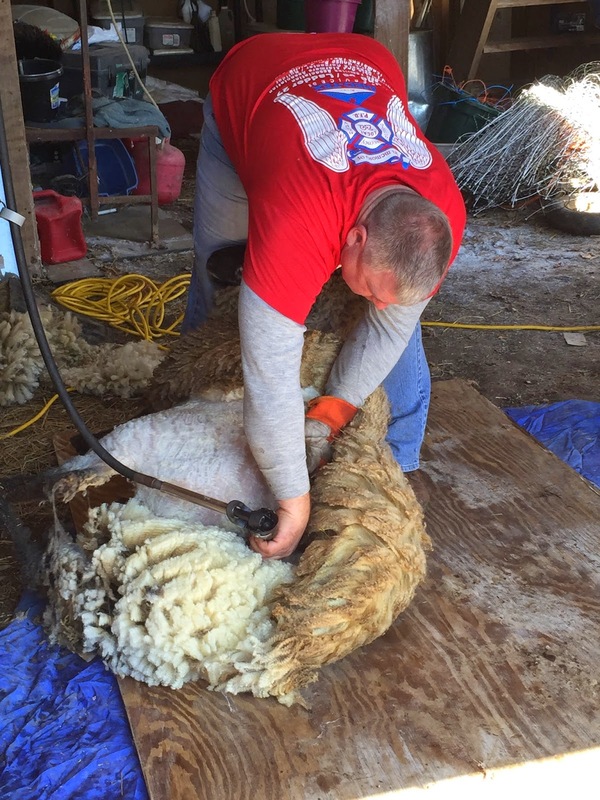 The fleeces go to market in various states. Spinners and felters may buy a sheep's entire fleece, but the fleece is often spun into roving, which is clean and ready to spin. Fleece that doesn't meet the quality mark for spinners is still useful and makes its way to markets as craft products that are often felted. The ram was first. He is a big one, but under the shearer's control, docile and quiet. As the fleece falls from the sheep, it's always a delight to see the color and luster of the wool beneath. When the sheep has been shorn, haltered and moved away, the skirting team moves in to pick up the fleece from the ground and move it to the skirting table. The fleece skirting table, seen below, has served us well. M. made the wood frame table about 10 years ago. 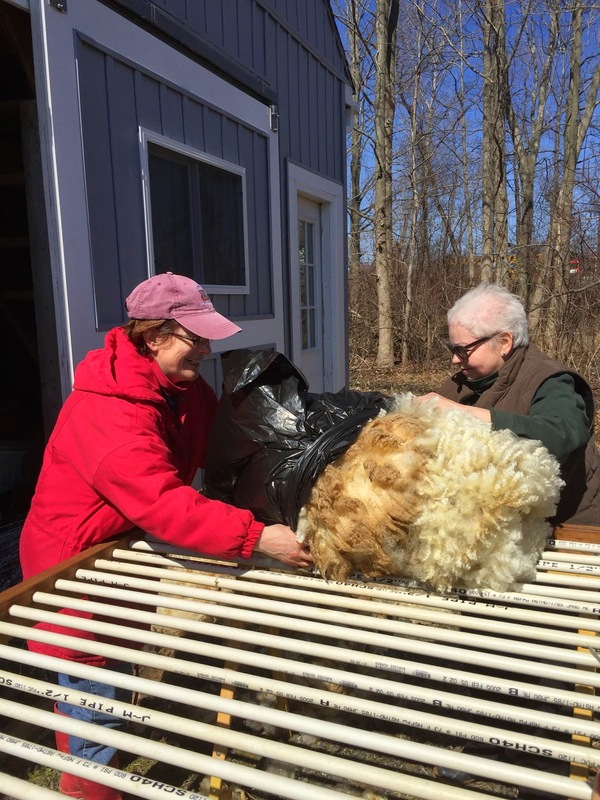 PVC pipes, which roll within a solid wood frame, allow us to move the fleece around, let the less desirable bits fall through to the ground, and provide a solid base to roll the fleece for bagging. The unit sits on two sawhorses. A dear departed friend, who was a member of this team for years, declared us official members of the ISSPP (International Society of Sheep Poop Pickers). 'Tis true. We pick a lot of poop. The bags are full, but the fleece isn't ready for market. K. will open each bag and in many cases, lay them out to thoroughly dry. (It's been a particularly wet year here.) Then she'll go through each of them again to ensure a clean fleece with quality fibers. Some is sold before shearing as fleece and some as roving. 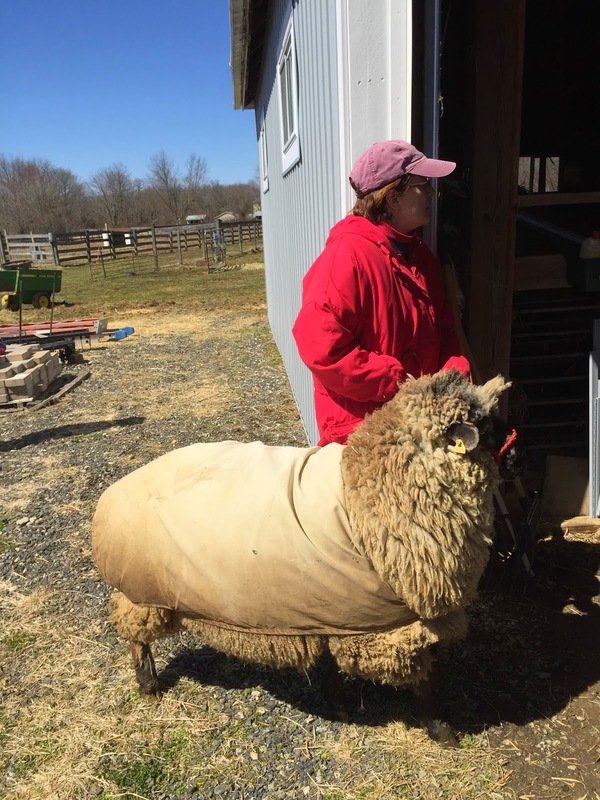 And some will go to local and regional markets, including Maryland Sheep and Wool, King's County Fiber Festival in Brooklyn, or Rhinebeck. Truly, a direct to consumer operation.